1975 - STURM UND DER DALEKS | Warped Factor - Words in the Key of Geek. 1975 saw the broadcast of a Doctor Who story often considered to be the finest in all its 52 years. Christopher Morley examines the inspiration behind Genesis of the Daleks. This year marks the seventieth anniversary of the end for Nazi Germany, with Adolf Hitler's suicide in his Berlin bunker on April 30, 1945, putting an end to the dictatorial vision of a Third Reich. Terry Nation, creator of the Daleks, had been a teenager at the time of the Allied victory- memories of which have often been said to have inspired his deadly pepperpots. Fitting perhaps then, that in 1975, their origin story should be broadcast thirty years after the end of hostilities. 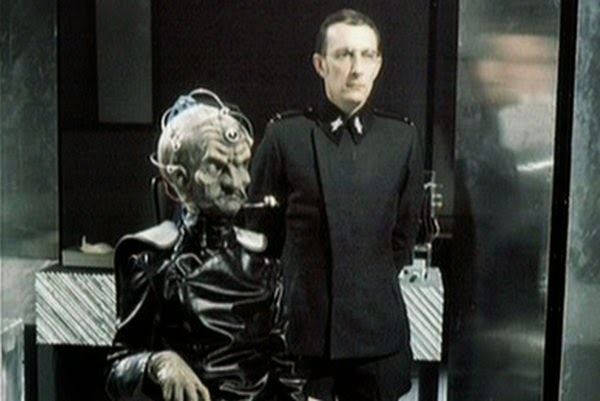 But is there any truth to the suggestion that Davros and his mutated Kaleds really are an arresting visual metaphor for the fellow with the toothbrush moustache and his followers? DOCTOR: Tell me, what exactly are Mutos? NYDER: Mutos are the scarred relics of ourselves. Monsters created by the chemical weapons used in the first century of this war. They were banished into the wastelands where they live and scavenge like animals. DOCTOR: In other words, genetically wounded. NYDER: We must keep the Kaled race pure. Imperfects are rejected. Some of them survive out there. DOCTOR: That's a very harsh policy. NYDER: Your views are not important. General Ravon, I'll take these two back to the bunker for interrogation by the special unit. RAVON: They're the army's prisoners. NYDER: Then you will release them to me. The special unit will get more out of them than your crude methods ever would. RAVON: Very well, if you insist. NYDER: I do insist, General. And I have a list of requirements here. All these items are to be sent to the bunker immediately. History had recorded such abhorrent thinking well before Michael Wisher pulled on his mask, as historyplace.com can attest. "Code named "Aktion T 4," the Nazi euthanasia program to eliminate "life unworthy of life" at first focused on newborns and very young children. Midwives and doctors were required to register children up to age three who showed symptoms of mental retardation, physical deformity, or other symptoms included on a questionnaire from the Reich Health Ministry. The Nazi euthanasia program quickly expanded to include older disabled children and adults. Hitler's decree of October, 1939, typed on his personal stationery and back dated to Sept. 1, enlarged "the authority of certain physicians to be designated by name in such manner that persons who, according to human judgment, are incurable can, upon a most careful diagnosis of their condition of sickness, be accorded a mercy death." In other words, exterminated under the orders of a man who could well have made it his mission to "terrorise and destroy millions and millions of lives and lands throughout all eternity" with "a fanatical desire to perpetuate himself in his machine". A machine powered by Aryan breeding, no less. Breeding rewarded with the Mutterkreuz or Mother's Cross as established in December 1938 by a decree from the Nazi state headed by Hitler "as a visible sign of gratitude of the German nation to children-rich mothers I establish this Cross of Honour of the German Mother". DALEK: We await your commands. KAVELL: Perfect, Davros, perfect. A brilliant creation. DAVROS: A brilliant creation, yes, but perfect, no. Not yet. I want improvements made to the optical systems and the sensory circuits. Their instincts must be as accurate as a scientific instrument. You will begin at once. Dismantle the viewer circuit. 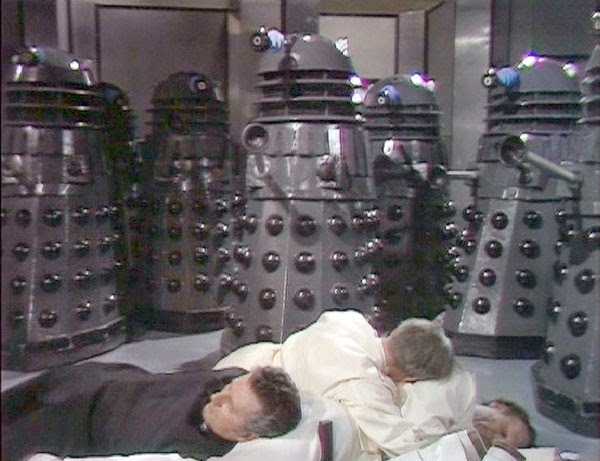 Once they are perfected, the Daleks are to be used in his own attempt at something similar to the Munich Putsch of 1923. DAVROS: Calm yourself, Nyder. There will be no investigation. NYDER: But you can't stop it now. DAVROS: I can and will! The council has signed the death warrant of the whole of the Kaled people. Only we, the Elite, we and the Daleks will go on. NYDER: The whole of the Kaled people? You would go that far? DAVROS: Did you ever doubt it? DAVROS: There is much to do. I want the genetically conditioned creatures installed in the machines immediately. Twenty of them. DAVROS: They are our troops in this battle for survival. Of course, like the Putsch the effort is ultimately doomed, despite the fanatical efforts of the man leading it. DAVROS: The issues are simple and clear cut. I have given my life's work to the survival of our race. The travel machine I designed, the Dalek, will give the creature into which we will mutate its only possibility of continued existence. GHARMAN: But you have deviated from that intention. You have introduced genetic changes that will alter the mutation into a creature without morals and without ethics. 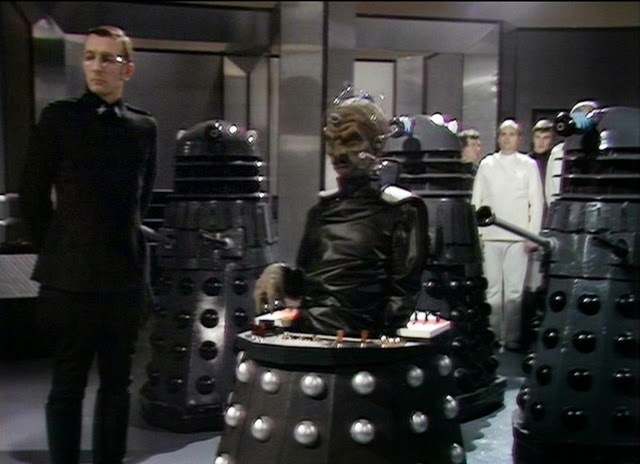 DAVROS: I have introduced aggression, without which no race can survive. GHARMAN: But aggression without a conscience. DAVROS: History will show that cooperation between different species is impossible. One race must survive all others, and to do this it must dominate. Ruthlessly. And arguably only the Doctor's moral dilemma over their destruction sets them on that path.